Explore the amazing creations of famous + much loved artist and sculptor Kimmy Cantrell. Here is his printable bio! Look + brainstorm at the features that make Cantrell’s work unique, recognizable and his own. Start sketching! Above are a few sketches in black + white, and below are a few sketches moving into color. We included 1 – 12 of our favorite masks created in our workshop, to give you inspiration for creating your very own! Absolutely LOVE how each mask is so unique to the individual artist! 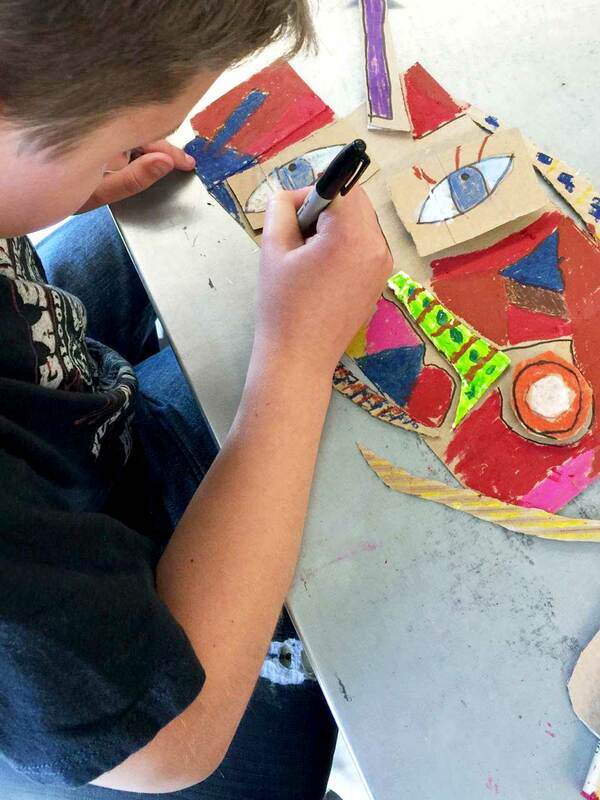 Explore color using marker and colored pencils to plan a 2-D idea to construct in 3-D! 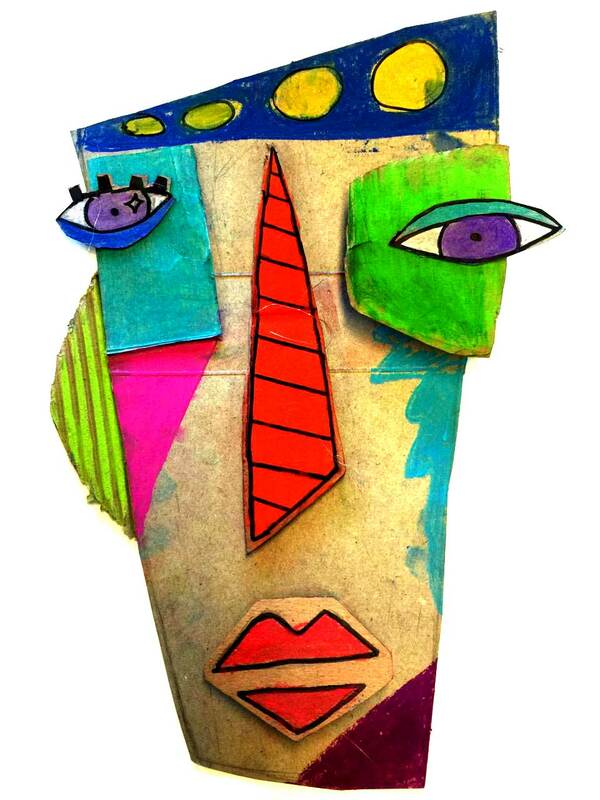 Once you select the sketch you want to create in 3-D, move into cardboard. 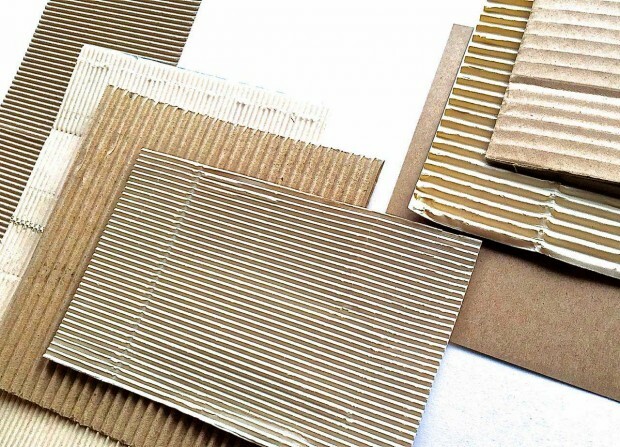 A mixture of thin, thick and corrugated cardboard works best to create variety. Save cereal boxes and other easy to cut boxes that can easily be broken down and stored. 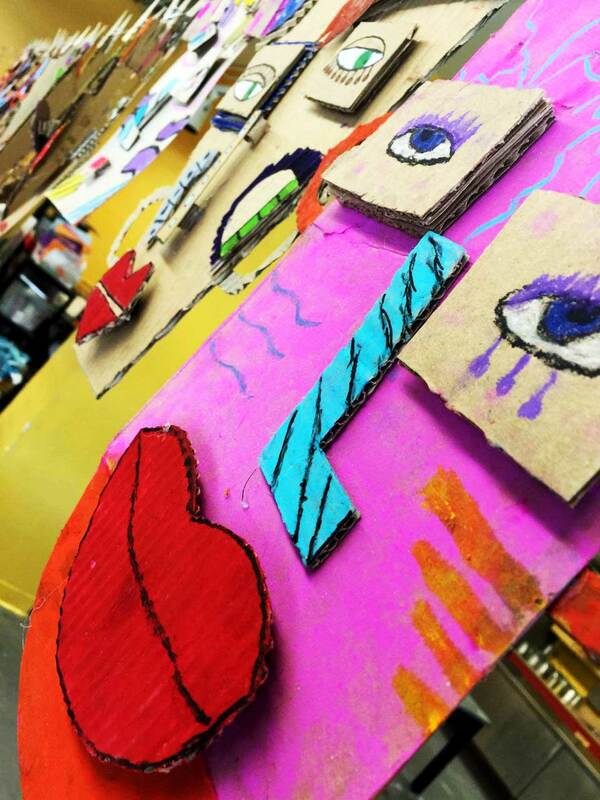 Group and organize similar cardboard together so the artist can make their selection. Go BIG! Determine the overall size of the face. We used large cereal boxes as they were tall and easy to cut. Sketch out the shape of the face and cut out. 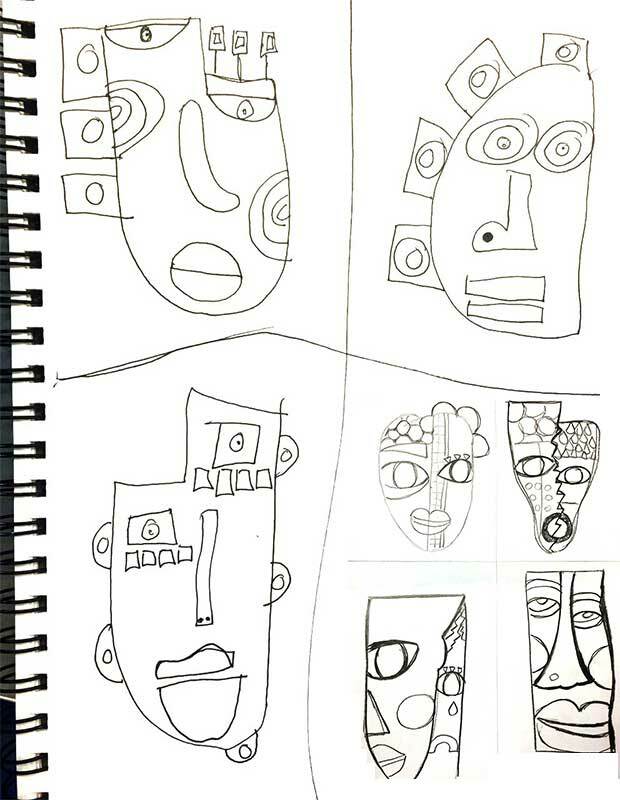 Move into drawing out the different facial features (on separate pieces of cardboard) using pencil and then finalizing with Sharpie. Cut out these shapes. 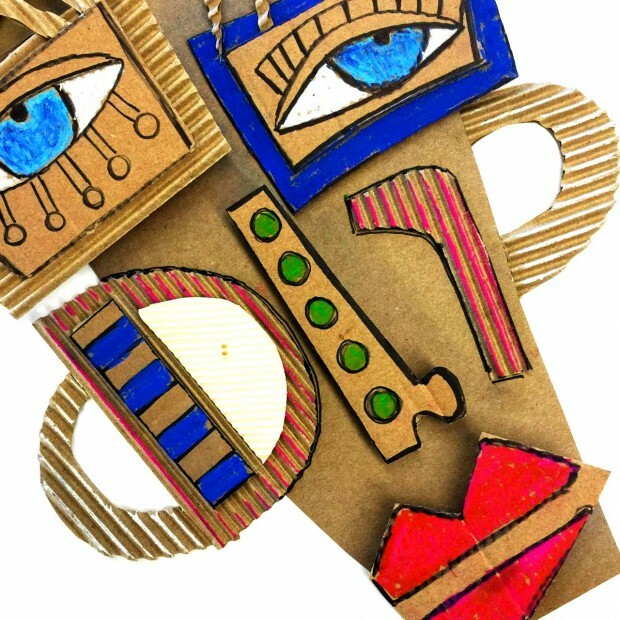 Use layers of cardboard stacked and glued to create a variety of levels of “pop-outs” to add dimension and to create added interest. A peek at our cardboard selection- thin, thick and various colors and sizes of corrugated. Use both chalk and oil pastel to add color! 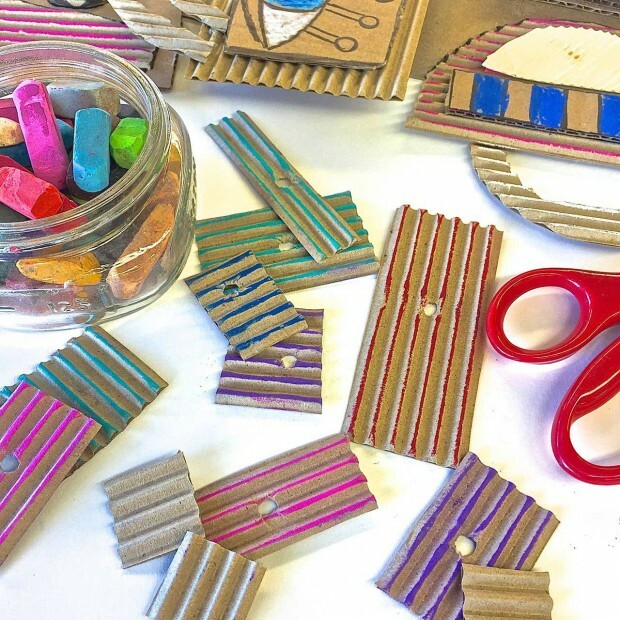 We loved how chalk pastel created this linear pattern on corrugated cardboard. A simple hole punch was also an exciting detail. Pastel is a very exciting medium on cardboard! Layout and arrange the sculpture before gluing down and play with the arrangement. We used hot glue but you could also use traditional white glue for younger children. Use additional Sharpie to define shapes, spaces and to add more interest! Our masks were created with children ages 10 – 14 years old. Love how each mask was so individualized and unique to the artist! The final stages! Loving the upper right corner of this piece filled with layered pattern of corrugated cardboard and cut squares. Love how this artist went BIG + bold! Doesn’t this piece have fabulous color and texture!!! Very “Kimmy Cantrell” inspired, yet so unique and one-of-a-kind! Her amazing additions and vibrant color scheme sure inspire me! Lovin’ the corrugated! We had a huge roll of this fabulous cardboard, but also discovered the inside of a “light bulb box” has fabulous + thinner corrugated cardboard for an additional fine detail! Start collecting!!! A peek at the collection! We absolutely can’t wait to get all these pieces displayed together! The look pretty amazing as a group but also so pretty fabulous individually! How amazing it would be to frame one for a home! Children LOVE when you showcase their work and this is one piece that is full of color, design, pattern, texture, personality and conversation! Life size! Wouldn’t these be fabulous to use in a play or parade! They looked so festive walking around on each artist! Let us know if you decide to make one of your very own! 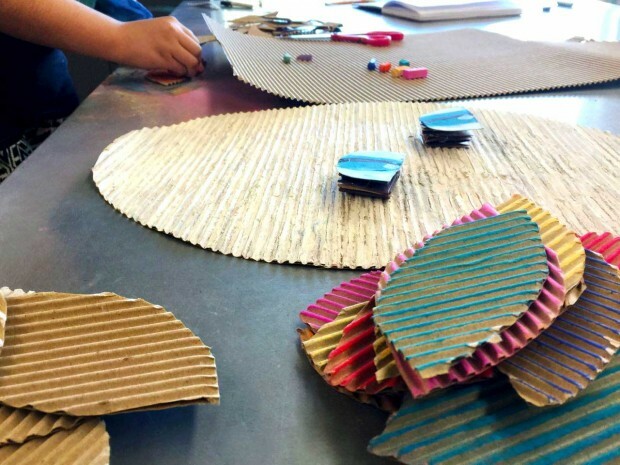 What exciting things are you making with cardboard or reclaimed and repurposed supplies? Would love to hear! Join us on Pinterest and Instagram! Would love to connect with you! I love the masks. Amazing colors! Have never ver seen art work like this! Thank you Ana for checking out our Masks In the Making! Sorry I’m just getting back to this- busy summer! This was a project I created based on our featured + famous artist’s ceramic masks, loved switching the media! Keep us posted if you decide to give this project a go! Would love to see! These are such lovely and wonderful projects – i would enjoy to keep in contact with you. Hello! Thank you so much for checking out our blog! I have added you to our email list so you can get future blog posts! Thank you so much for connecting Tina! These are beautiful! Excited to them with my fourth graders! Any tricks on how you peeled the cardboard sheets to get the corrugated side? 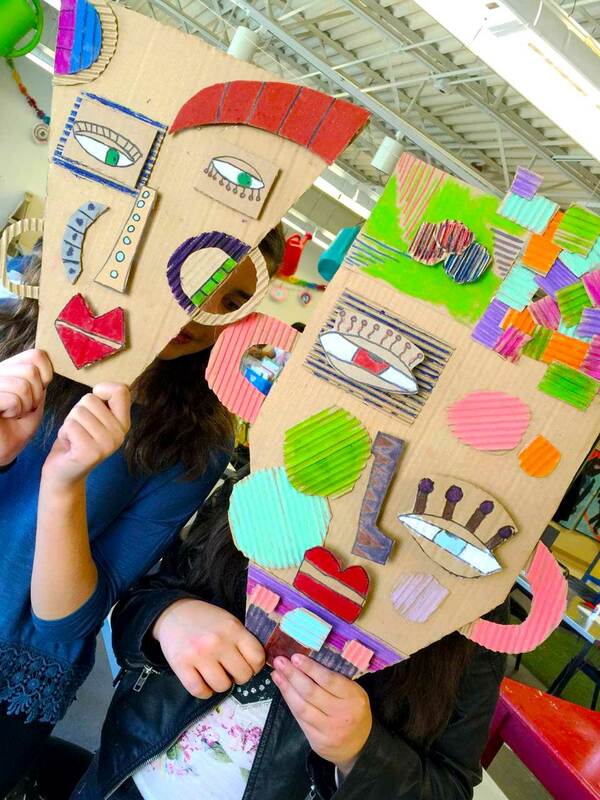 Thank you for discovering our MASKS IN THE MAKING Christina! So happy to hear you are going to create your own with your fourth graders! As for the corrugated cardboard, I was able to order a large roll of it, which was very inexpensive to work with! Also, the inside of light bulb container cardboard is fabulous to also use, as a more delicate/thin corrugated option! Would love to see your creations as they are complete! Keep in touch! Where did you order your roll of corrugated cardboard? I believe you can order a roll via an office supply or packaging company! The best of luck! It should be pretty affordable and long lasting! Thank you for following along! Loved the colors and creativity. Thanks for sharing. Thank you for checking out our Masks In The Making post! We loved experimenting with mixed-media on this project! Thank you for your compliment on the colors + creativity, greatly appreciate! Love your mask lesson! I teach an 8th grade with no sinks in the room! This lesson will make my 3D requirement work! Thank you for sharing! Would love to get your blog! Hello Lisa! Wow, no sinks in the art room…you must be a woman of making miracles! 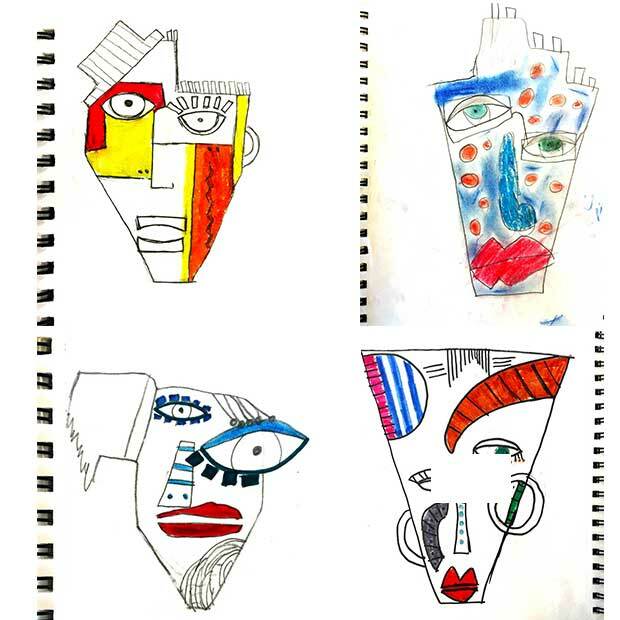 So happy that you’ll be able to use our Masks In The Making project for your 3-D study! It’s sure a fun project! Would encourage you to go BIG on this project, size-wise! 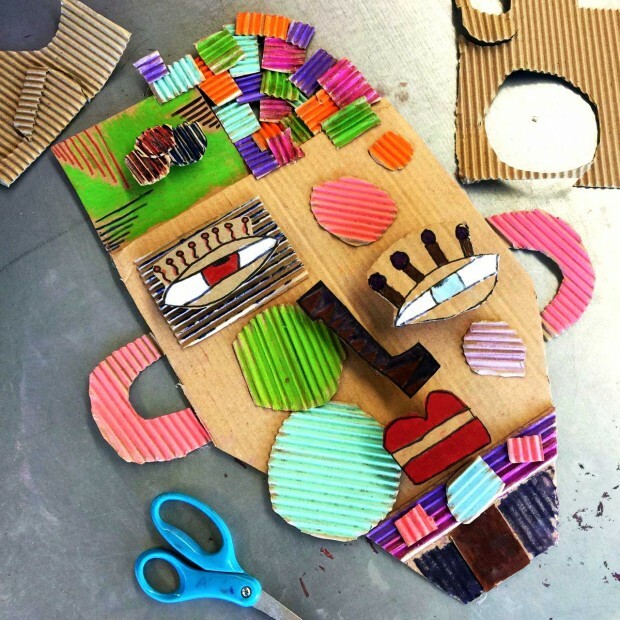 Loved that there are so many different materials to experiment with on cardboard, to give each child a good amount of freedom! Would love to see your photos once you finish your masks! Tag us on IG @handmakery! Yes, will add you to our blog email blast! You can also join our Facebook page! Thank you for following along! Carla, thank you so much for your patience! We had a busy end of summer + back to school this last month! 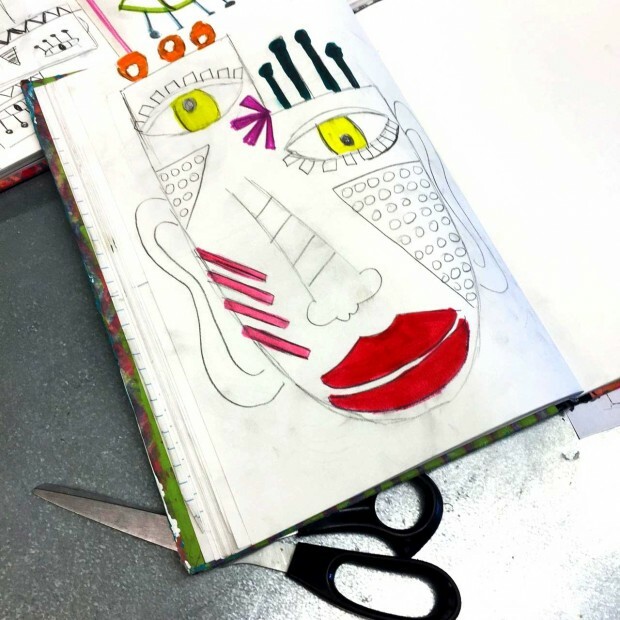 Yes, love your idea on incorporating our Masks In the Making into an abstract styled portrait for your 5th graders! Think the two would tie in beautifully! I did this project with middle schoolers 5-8th and they absolutely loved it! Really think it’s important to have varied textures of cardboard, varied art supplies to select from, and encourage them to go BIG! It was truly amazing how many variations they created, each mask was unique and original. Think your artists would love that their piece was an expression of themselves! Their process will be so much more personal and from the heart. With this connection, I know their creations will shine! Tag @handmakery on Instagram, would love to see your finished work!